Adam Scott enters the final day of the PGA Tournament in second place with a score of -10. 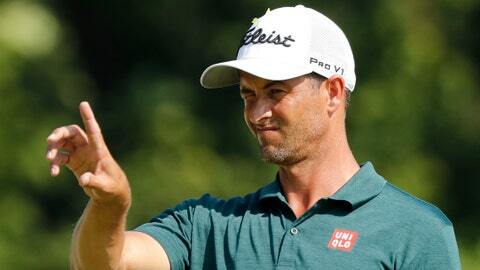 ST. LOUIS – Adam Scott was back in contention for the first time in what seemed like an eternity when the former Masters champion began the final round of the British Open last month. “And I took the wrong mindset,” Scott admitted Saturday after shooting a 5-under 65 that left him two shots back of Brooks Koepka heading into the final round of the PGA Championship. Scott was one of the world’s top players a couple years ago, his green jacket and No. 1 ranking still fresh in peoples’ minds. He’d won the Barclays Classic and three more times after his triumph at Augusta, riding a sweet swing and long putter to the forefront of golf’s youth revolution. Not quite. But he has fallen far enough on the FedEx Cup points list that determines whether he gets to keep his PGA Tour playing privileges that he entered next week’s Wyndham Championship in part to give himself another opportunity to pile them up against a relatively soft field. By contrast, the field at Bellerive this week is one of the best all season, and somehow Scott has found some of his old magic. It might be that he’s back to using a modified version of his long putter, or perhaps it’s a peace of mind that came with rehiring his brother-in-law, Brad Malone, as his swing coach after a couple of years apart. He’ll play it with a heavy heart, just as he has the entire tournament. “I mean, it would be more-than-twice the thrill for me,” he said, “but no matter who wins tomorrow, if that person has met Jarrod, they will have felt something with him passing this week.